I recently saved the paper below and read it the other night... boy did it provide some interesting insights! 200 watchers, 200 trees, 200 of every animal... why the significance of 200? The fallen angels, were they they progenitors of the advanced humans, like the saints (maybe even the LM's "beasts")? Remember almost all of our current history is written by the winners, the saints had magical powers, seems to me they were "adopted" by the church much like the other sacred and ancient "pagan" sites were. More accurately, following the deluge and destruction of Atlantis and the original biblical battlezone of the British Isles that left northern Scotland all squished back in 3000 or so B.C., the Romans and the Church set about covering up true history and making their own, re-writing prophecy into the bible and editing it all to suit their agenda of control. God, Enlil, was angry as the "lust" and forbidden knowledge was passed to mankind... sounds to me like Enki and 199 of his angel buddies went down to earth, taught the new slaves more than they should, created a few chimera for fun which made the head god of war pretty miffed! Satan/Lucifer/Enki was with them when they were punished but disappeared! So if this was the original deluge of Deucalion/Flood of Noah post 13 year war of the gods and giants and Enki vanished, did he then go underground, plot the downfall of his brother with an LM resistance, going to war in the 1300's again and finally banishing him, winning the moon (heaven) back, the black death being a result along with the final meteor strike. I'm reasoning at this as the biblical comet deluge must have been more severe to add 5 days to the orbit post-expansion. There is definitely a gap in knowledge i'd like to explore more there, it also seems to me like the Templars were the elite troops of Enlil and his loyal band of Jewish or Roman subjects, i'd like to know more about the timeline from 1300-1500, the big picture is slowly forming but it's taking some time, much more reading to do! Dreams... sounds like a future landscape and vision came to many of the fallen angels and prophets, indicating advanced abilities perhaps? For the flood and fire/brimstone and subsequent destruction it brought to us, I couldn't help but notice the mention of the water drying up and evaporating, something I think hasn't really been considered before. If Comyns Beaumont is correct and a passing (or about to impact) comet and it's tail brings with it plagues and raining frogs and lots of excess water, perhaps, even with expansion, the sea level wasn't affected that much due to the extreme heat, just say enough for some civilisation a few miles off the coast of the UK to be affected for example, once the new sea level settled that is. More comet water balanced out by extreme heat and earth expansion, more landmass, along with a possible melting of ice caps, extra water from the core/hollow earth (see Thomas Burnet) and the return of the water vapour as rain, after all nature likes to seek balance. Some very interesting reading in the PDF above, what does everyone else think? I have to agree with his well thought out and researched summary, the giants were definitely real, well said! Too many researchers are too quick to dismiss an important piece of the puzzle in favour of their own theories. CB wasn't 100% correct, few are, but his main theory not only stands up but I keep getting confirmation of it from other sources I watch and read. Another curious synchronicity is that like Sheridan i've also been reading up on ancient pathways and the "old straight track". Forbes books look very interesting and i'm trying to track them down too now, might not be easy though, tried a second hand bookshop today and they hadn't heard of him but i'll keep on hunting for his books, especially Ages Not So Dark. Thanks for the heads up about him tymeflyz, looking forward to reading and hearing more about his theories. That's me, still working on it but no progress for now as I continue reading more material to try and get a chronology framework, getting there slowly but i've only recently been able to access a PC regularly again so it was on hold for a while. So far, out of everyone i've read, daniel is still the most accurate and ahead of the curve by far when it comes to piecing together true history. The most difficult part about understanding the past is coming to terms with "everything you know is backwards." When I first looked at the Reciprocal System, it wasn't about learning a new theory--it was about unlearning all the bad assumptions I had been taught over decades of schooling. Unfortunately, religion and spirituality have become "color blind." So when you start looking at all these evil giants running around eating people, one must ask themselves if this is just "propaganda," or truth? At the conclusion of the war between Gods and Men, ENLIL/Jehovah took dominance of the human part of this world--and wrote the history books. The Nephilim sided with ENKI, so I'm sure ENLIL did not have many nice things to say about them. You may have heard of that there were two races of giants, the Nephilim and the Raphaim--not two races, same race before and after the Deluge. The only difference is that the Raphaim, the survivors of the Deluge, were quite a bit more pissed off at the ANNUNA than their ancestors were. Something I have noticed in the study of mythology is that man has copied the behavior of the gods, in enormous detail--probably just the way the unconscious collectives function. If you want to understand how the gods behaved, just look at how man behaves--now. Man was made in the "image" (tselem, DNA) of god... and that includes a lot more than a physical structure, it also includes a way of thinking and feeling. The NWO is just mankind copying the SAME STRUCTURE that the gods used, in the past. By linking the two, you can see both were mankind is going, and where the gods have been. And the NWO types belief that by copying that process, they, too, will end up as gods. As to the destiny of mankind, well it brings me to the final sequence of Babylon 5's battle between the intelligent races and their gods, the Vorlons and Shadows... mankind will not survive by choosing sides. Like Sheridan, he must tell both the gods and demons, "Now get the hell out of our galaxy, the both of you!" ("Into the Fire," Season 4, Episode 6). The hardest part of this difficult stuff is living amongst all the idiots.. There certainly are more than enough distractions all around exept maybe in the wilderness, well even in the wilds you get some distrations: predators, mosquitos etc. If you balance your energies and concentrate you can shut off, at least some, distractions. I have found that when I balance my energies I can be more calm even if the neighbor is being annoyingly noisy. Comparing it when I didnt actively balance my energies, I would only be madder to the noise makers, so it helps immediately. Which reminds me of this course thats going to begin this saturday (22th), it is Qigong course, four weeks every saturday and is about 4 hours long per day. 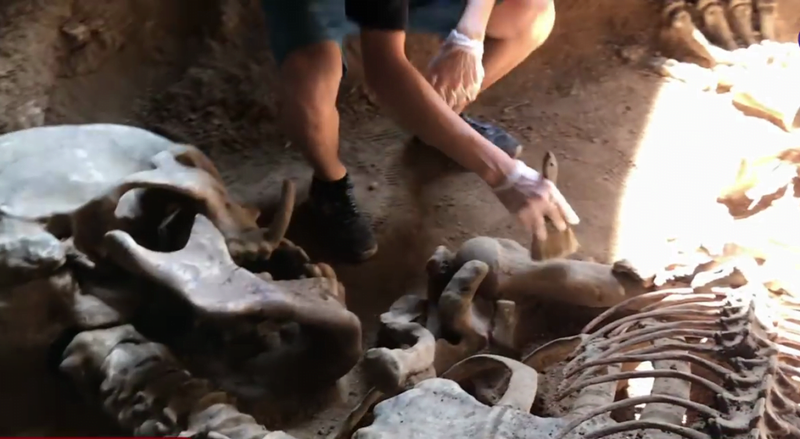 Check out this Giant skeleton discovered in Thailand in November of 2017, its all wrapped up in a giant horned serpent... did the serpent win and then get squished underneath?? WOW ! I think they both died there like that at the same time or something like that. Serpents/snakes usually dont get crushed by their prey, the constrictor snakes are all muscles as the venomous kinds and that horned one seemed to be a constrictor kind, because it was coiled like the ones we see in the nature thesedays. I also think that someone higher in the command chain wanted to kill giants and sent serpents after them. Most likely those kinds of serpents were engineered to be like that by AN to get rid of unwanted/obsolete creations of the Annunaki. Whoa! Amazing, how well preserved it is. Almost too good to be true. Look at the upper jaw. There is a horn just like on a wild boar. And the size of the hand. A giant could easily grab and lift a human by the head. edit: I was just thinking about Warcraft II. The green colored orcs also had these kinds of horns on their jaw! Is there any information in history books about the skin color of giants? It really is almost too good to be true. The "horn" is called tusk, more properly. I believe the difference is that horn is made of Keratin same as hair, while a tusk/tooth is mostly hardened calcium. I understand the lack of vocabulary which I also have from time to time, so I dont mean to be mean. If I recall Warcraft games and the movie the orcs had tusks in lower jaw not upper, whereas wild boars have tusks in both upper and lower jaw. PS. I have played Warcraft games many times and still have the 3rd one and have seen the movie also. Yes, you are right. And no sweat btw, a grammar nazi like me can take a good amount of critique, if valid. I don't have that big of an ego. Wasn't a lack of vocabulary though, at least not one that resulted from a translation error. Because I already had the wrong word in mind in my own native tongue.